We’re pleased to announce our new affiliation with Tagoras, respected association-focused consulting and research firm. We’ve supported their efforts for some time — as you’ve seen from our glowing reports of their research. We hope you’ll investigate their offerings if you haven’t already, and will continue to watch the aLearning Blog for future notices of their releases. Remember: the more informed you are about the decisions you make, especially in elearning, the more likely you’ll get the buy-in and support your online learning initiative needs for success! I missed the recent offering of this Webinar from Brandon Hall Research (and I suspect that it will cover their online database that allows subscribers to compare systems), but it might be exactly the information and resource you need if you’re in the hunt for a new LMS. Learning Management Systems: Trends & Issues with Tom Werner and Richard Nantel. This presentation will help answer the following questions: What have been the recent trends in learning management systems? Where will these trends lead? And what are some of the issues that LMS vendors and users face today? (Sponsored by Outstart). Read more and register: http://www.facebook.com/l/078e3o-NMos8DQWMk8cUL0CwPxA;www.brandon-hall.com/webinars/webinars.shtml#lmstrends. Collaborative Learning & Collective Intelligence with Gary Woodill. 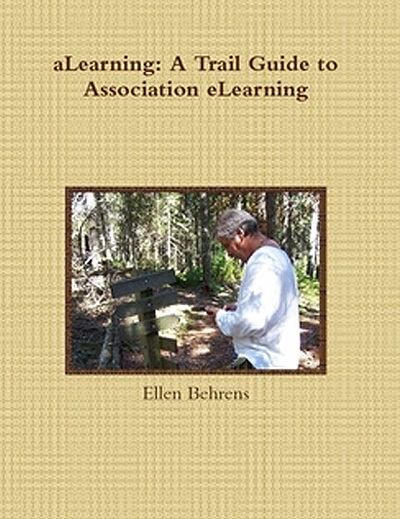 The presentation is based on a series of four research reports on computer-supported collaborative learning (CSCL) that Gary produced in the past year and will include foundational concepts, case studies, key resources, software tools, and a summary of the research on the effectiveness of collaborative learning. The presentation will include a question and answer period at the end. Join Gary and other participants in getting ahead of the curve on this important emerging topic in learning and development. (Sponsored by Cornerstone OnDemand). Read more and register: http://www.facebook.com/l/078e3n9kksioZWhaEXj7x3_4RkQ;www.brandon-hall.com/webinars/webinars.shtml#collaboration. And the emails just keep coming in! Of course I welcome more leads and suggestions for LMSes that are well-suited to the association sector and will continue to include links periodically. I am finding that I just don’t have the time to try out all of them. I am hoping to get a sample course together to post in various places so you can see how the same course or tutorial would work/look in different environments, but what I produce and what you’re going to offer are likely different anyway, so doing your own experimentation is your best option. Finally, a few words of caution: You’ve probably heard that the wiki platform Ning is shutting down its free option; subscribers either have to move their content off Ning or start ante-ing up for the paid version. Always keep a backup of anything you put on a free site and have a Plan B in case that option suddenly isn’t available to you. Nancy Safer [nancy@edcetratraining.com] at edCetra Training tells me they have a “mini” LMS as part of their edXact! product, which is primarily a tracking and reporting system. Their fees sound reasonable, compared to many others, roughly $6000-$11,000 annually. The case studies I read (I confess I didn’t read them all) suggest a client base of primarly large organizations with implementations with other systems. If you have a courses requiring tracking and reporting that must integrate with a large AMS, this option is worth exploring. “I just wanted to update you on where we are in our move toward a delivery platform. The big update being that you can now deliver training via our SCORM Cloud product. Just upload a course, then send it to a group of learners directly from the SCORM Cloud dashboard. Learners click the link in the email and the course launches. Easy peasy. And while we’re mostly talking to people about it in terms of being able to see how SCORM Cloud works before they take the step of integrating it into their LMS, it could be used by anyone who needs a simple delivery system. Small association chapters for example. You can contact Susan directly at susan.lewis@scorm.com or by calling (615) 852-5123. Educadium has a nice platform called Easy Campus. I’ve been working on a course about Webinars to upload there, but rather than hold up mention of their system while I keep trying to make castles in the sandbox, take a look yourself. There’s a blank sample at http://campus.educadium.com/aLearning. Login with the username “alearning2” and use “alearning” as your password. This was a free option, so set up your own campus if you’d like and see what you can do! For more information about Easy Campus, contact Jim Friscia at jfriscia@educadium.com. “Patrick” added a comment to LMS = Losing My Smile, which said, in part: “Our company has created TOPYX and TOPYX Lite, a very affordable fully hosted Learning Management offering that allows an organisation have a fully branded, e-commerce enabled, with no user or course limits, for as little as $500 for TOPYX Lite, $999 for TOPYX, plus monthly plus minor hosting fees. “An association can present and track courses, integrate member and course communities, and even integrate to a number of social networking sites, like LinkedIn, Facebook, or Twitter. “There’s a lot more included with a subscription, but I don’t want to turn this into a blatant sales pitch. I just want to make you aware of some highly capable alternatives to either the high priced LMSs or the high manpower expenses associated with implementing and customizing the various open source alternatives. I promised Patrick I’d take a look but frankly haven’t had a chance to do so. Didn’t want to hold up this mention, either, so take a look around and see what you think. If you are interested in learning more, please contact Jennifer at (425) 996-4201. I’m not sure about you, but their focus still sounds sort of corporate-oriented to me. But it’s worth checking into if a Sharepoint-based system is what you’re looking for. I’d provide the UDUTU option I’ve been using, but they’ll charge me $$ and I’m all about free when I can advocate for those options, so though I was able to create a neat little course with it, I’m still trying to get it hooked into the back-end of my Web site to make it work. In the meantime, you can set up your own UDUTU account at www.udutu.com to see what’s possible there. Have heard about the EZ LCMS but haven’t tried it, either. They have a free trial, so prep something then upload it to see how it works if you want at www.ezlcms.com. Cost is $399/mo for up to 1000 users, with PPT plug in, ILT and Web conferencing options. Vignettes Learning offers LMSSimplify, which they describe as enabling you to “construct and publish online learning programs developed with Articulate, Captivate, Flash, Lectora, and other authoring tools, register participants, assign curricula, set up training schedules and alerts, build pre- and post-tests and multiple methods of reviews, tests, and evaluations. The LMSSimplify provides an advance randomized certification function, as well as extensive reporting on learning performance and certification. It also provides a classroom registration system and email alerts.” Pricing starts at $500/month and its hosted with Vignettes Learning rather than on your server (which makes it a SaaS system). Don’t forget to get a copy of Association Learning Management Systems from Tagoras . Originally priced at $199, the report is currently available for just $99! This is a bargain for all the info you’ll get — but this price is listed as “temporary,” so don’t wait to order. If you’ve used any of the systems mentioned here in the aLearning Blog — or a one that hasn’t been mentioned yet — I hope you’ll share your experience by adding a comment about what you’re using or leaning toward using, and why. Or if you aren’t using an LMS… why you made that choice. And let me know if you’d like these quick descriptions and links saved to a wiki or someplace where they’re more easily accessible in one place. Knowing I’d open a can of worms by venturing into discussions about LMSes (Learning Management Systems), I pulled out my opener anyway and yanked off the lid (see LMS = Losing My Smile and LMS Business Model for Associations?). First, let me say that I don’t endorse any product or service, but that I will pass along suggestions when something sounds like a good fit. Second, no association learning leader (or other executive) should venture into LMS possibilities without having devoured — with highlighter in hand — the Tagoras reports on this topic (did I mention if you purchase the package you get a copy of the aLearning book as well?!?). Having said all that, some things became really clear to me over the last week or so as I thought about LMSes for associations. I posted a question the the ASAE’s LinkedIn Group and got some very helpful responses, and I’ve likewise been holding some long and detailed e-mail discussions with representatives of some LMS providers. What started as a rant about average pricing for an LMS has blossomed into a flower of an entirely different color and type than I would have expected. — We need LMSes for different purposes. LMS providers have designed various systems to meet our various needs. But they’re all called LMSes, so the distinctions get blurred (more on this later). — Pricing is all over the place because of these different types of LMSes, each with their own features and ways they can be accessed, among other variables. — Unless we clearly define what we need, we can’t know what we’re looking for, nor which type of LMS would best suit our needs. — LMS providers are quickly adapting what they offer to what we need. This is a blessing and a curse — we have more choices, but there’s also more confusion. — Finally, unless I haven’t come across it yet, the ideal LMS has yet to be invented (more on this in an upcoming post). Yes, an LMS is a learning management system. But some learning we offer online is instructor led, and some isn’t. Some of us offer Webinars, some don’t. A few of us make asynchronous, stand-alone courses available, others don’t. LMSes have come through a long series of revisions over the years. Iterations have included training systems designed primarily for classroom use to those designed to launch only asynchronous, stand- alone courses. Others, such as Blackboard, started as instructor-led course management systems but have evolved to include more features designed to enhance interactivity and incorporate more social media, such as video sharing. So the first question to ask yourself is “What do we plan to do with our LMS?” Do we intend to offer instructor-led online courses? Asynchronous courses only? Structures for member-to-member, informal learning? Webinars? Let’s face it: some systems work for certain types of content delivery better than others. It’s time we talked about those various types of LMSes, even though many overlap in what they can deliver. — Blackboard ProSites : Probably the grand-daddy of all instructor-led course management systems, Blackboard once provided its platform for free use (I had a novel-writing course on it for awhile). Pricing now = $9500/year for 200 users and 50MB course limit. — Cisco WebEx : The WebEx Meeting option allows just 25 participants — or so it says. We were able to add more participants at a small per-user fee to leverage this option for Webinars. Starting at just $49/month, this option is provides for online recording and replay. — KRM : All-in-one Webinar provider, from marketing through production and archiving/re-sale, KRM has been in the association sector a long time. — CommPartners : Webinar production and archiving/library creation vendor. — DigitecInteractive’s Knowledge Direct WEB : Features include content search (including Flash content), discussions and wikis, pre-testing, regional versioning, built-in eCommerce, and the capacity to export PowerPoint content into MP3 “podblasts,” cell phone, and Flash delivery. — CNNet : Asynchronous courses, at least those contained in Flash files, can be launched through this LMS, though record-keeping hasn’t been tested. — Element K’s Knowledgehub : Element K has been in the elearning business for nearly thirty years, outlasting most of the other companies that started at the same time. They offer custom content development and an array of ready-made titles as well as a feature-laden LMS complete with Web 2.0 communication and collaboration tools. — Web Courseworks’ CourseStage LCMS : What Web Courseworks has done is taken Moodle (an open-source LMS), developed a “derivative” system from it so that you won’t have to hire a programmer or company to adapt Moodle to your needs. They’ve created a system that’s ready to go and still affordable. It enables access to stand-alone asynchronous courses, interactive games, and includes an eCommerce feature that integrates with membership database systems, education credit tracking, and built-in course development so you can create your own tutorials or full courses and offer them through the system. The system also accommodates Webinars through a partnership with CommPartners. Podcasts, video files, RSS feeds, blogs and other social learning tools are embedded as well. — ePath Learning’s ASAP : CEO Ralph Pastor describes their system as a “fully functional hybrid LMS/ LCMS service offering … that is a Web 2.0/cloud/ multi-tenant solution,” perhaps the only such system on the market. Pricing starts at about $350/month. If I missed anyone’s recommendation, let me know. Okay, there is Moodle. That one’s simple: if you have the tech savvy in-house to customize it (and the time), go for it. If not, seek a Moodle “derivative” like CourseStage. Oh, and the perfect LMS for associations? More on that next time.